Today, we spotted a roundup of free Walmart coupons on Walmarts website. There are some awesome deals from Walmart including freebies and free coupons. You can get a free printable coupon for Giovanni Rana refrigerated sauces and pasta. 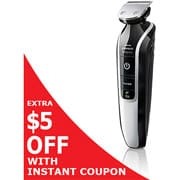 You also can use a Norelco coupon to save an instant $5 off a Philips Norelco Multigroom 5100 model. That coupon deals brings the price of the razor down to $24.97. Lastly, you can score a special Glade coupon for the next time you shop at Walmart. This coupon is only available while supplies last on seasonal scents.